Why not get a stencil just for yourself. Your own logo on top of every coffee!!! All you have to do is send us what you would like to turn into a stencil and we'll do the rest. The process and pricing is so simple. Send your artwork or logo to: stencilsartwork@gmail.com that you want us to make into a stencil along with your details (i.e. delivery details and dimensions of your cup). Check out our stencil guide below for best artwork results. We 'stencilise' it, but we may adjust it slightly so that it holds together. 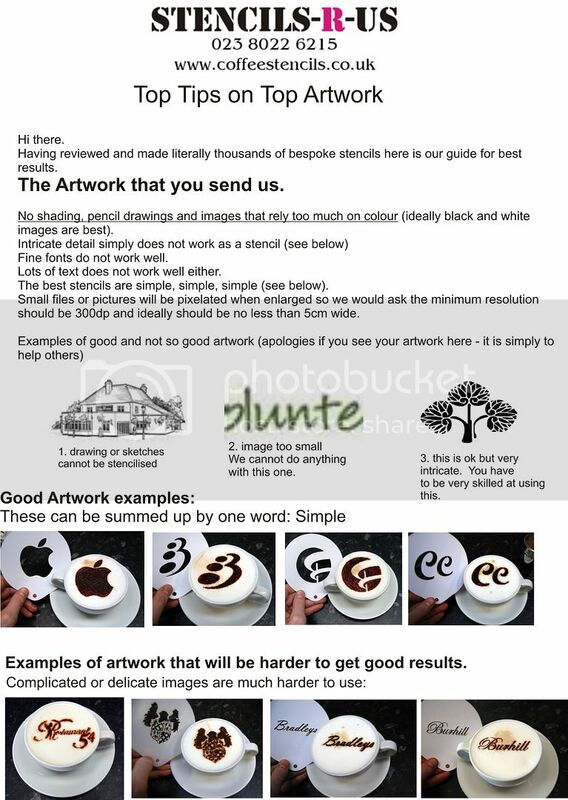 We send you either a jpeg of an actual coffee (like the one above) or a jpeg of the artwork that we have done. You decide on any changes (if any). Let us know how many stencils you would like. Stencils arrive in super quick time. (about 3 days to UK addresses). Please note that our product is the stencil, not the finished cappuccino. Stencils do take some practice to use to get the best results. But if you decide that you cannot use the stencil for any reason, we cannot refund bespoke orders. £4.95 + vat for subsequent ones of the same design. Postage and packing to UK address is charged dependent on weight. Place your order with us over the phone (we can take delivery details at the same time). Our number is 01432 840712. If you are happy paying over the phone - this is the quickest and simplest payment option for bespoke stencils. Or, you can add your order to the shopping cart below and enter card details in the shopping cart. PLEASE READ THIS BEFORE SENDING ARTWORK OVER TO US. - Make the artwork as big as possible (e.g. 300dpi). Small thumbnail graphics (72dpi or small logos off websites tend to be too small to work with. - Send artwork as a JPEG, PDF, EPS, PSD or TIFF file. - Currently we cannot turn photos in to stencils. - The best stencils are those that are simple, bold, not too detailed. If your logo has lots of words in it, then think about having just the motif, or letters rather than the words. Finally have a look below for some examples that we have already done for customers. Here are some examples that we have done already.